Fancy a snack in Cambodia? 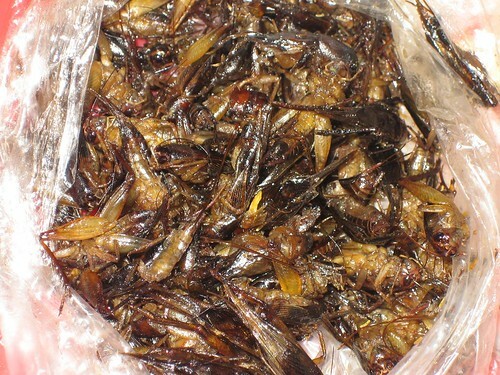 Look no further than fried crickets, extremely popular as a snack on bus journies. I remember after one bus trip the floor was covered with crunchy cricket remains. I tried some whilst at Angkor Wat, they really are discusting, bitter and greasy. Urgh, makes feel sick just thinking about them! That picture gives me the heebies…I have eaten “a” fried cricket, but I don’t know if I could handle an entire bag of them. Have you tried chocolate covered cricket? Not bad….